Water/Methanol injection users now have the sophisticated safety system they’ve always needed in an easy to use package. Unlike most competitor systems that only check flow at a single point, AEM’s Injection Monitor is a smart system that monitors the entire flow curve. Flow versus injection rate data is continuously collected and any deviation away from an acceptable baseline flow curve will trigger an alarm output. This output can be used to reduce boost, pull timing, switch maps, or any other function to protect an engine from harmful detonation in the event there is an unsafe operating condition. 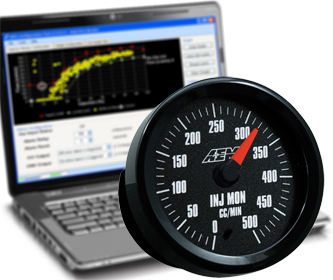 The AEM Injection Monitor features a wide variety of innovative features including PC configuration software with USB connectivity, an “Auto Set” feature that automatically provides a best-suggested baseline configuration, a high-tech analog display gauge with user adjustable backlighting that can be flashed when an alarm is triggered, and an internal data logger that records injection and alarm status data. The Injection Monitor works with virtually every water/methanol injection system that uses 1/4"OD tubing! · Monitors the entire injection curve and its relationship to injection progression. · Can be used with any injection system with ¼” OD tubing. · Tunable PC based software with USB connectivity. · Injection Monitor software has a built in Auto Set Limit feature that automatically suggests best alarm configuration. · One low side (ground) driver and one high side (+12v) driver can be configured to turn on or off during an alarm condition. · Internal data logger records all injection flow and alarm status data. · High-tech analog style gauge is easily readable and user programmable for either 0-500 cc/min or 0-1000 cc/min flow ranges with interchangeable black & white face plates and black & silver bezels. · Gauge alarm and backlighting color is fully user adjustable through software to match virtually any OEM dash or desired color. · Built in warning lights inform the user of an alarm trigger. · Injection Monitor software offers a live gauge view that displays both injection percentage and flow. · Fully adjustable alarm delay and alarm reset period. · 0-5v analog output for use with data loggers and virtually any engine management system, such as the AEM EMS or F/IC. · High-quality precision flow sensor included.